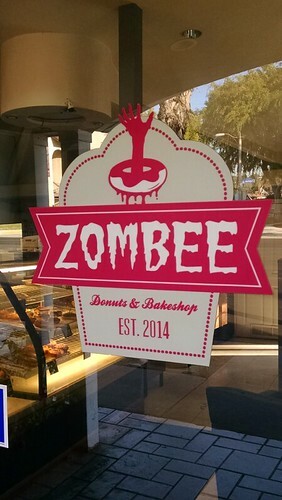 On a recent West Coast outing, the Zombie Rights Campaign staff had time for a short detour to the Zombee Donuts and Bakeshop, located in Fullerton, California. 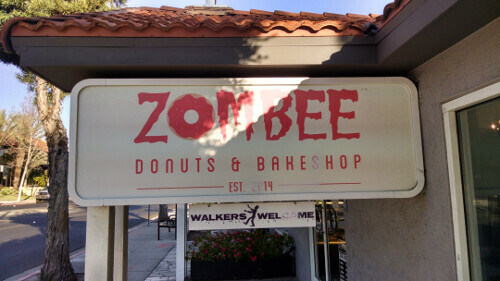 As the name suggests, and the website confirms, this is a bakery, focused on donuts and similar pastries, with a decidedly Undead theme. 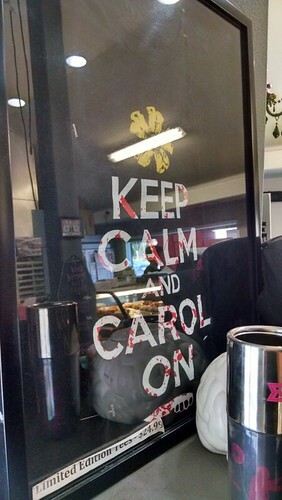 Come for the donuts and baked goods and stay for the atmosphere. 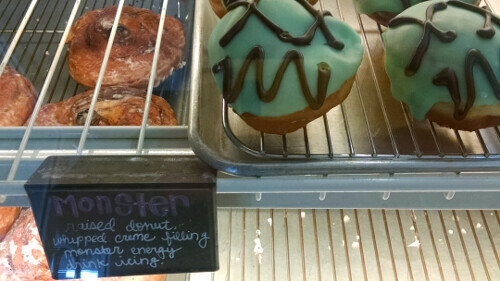 We wanted to the Monster donut in particular, with its adorable Zombie green face. Now, if you dislike energy drinks, it is clearly not the pastry for you, but the ZRC reviewers found it pleasantly.. well, like a donut crossed with an energy drink. A word of caution on the decor and some of the merchandise, however: a bit of outreach could be useful here. Not everything is, strictly speaking, Zombie friendly. In fact some things on display are distinctly Zombie-Unfriendly, particularly the Walking Dead references. Still, all in all, the Zombie Rights Campaign was pleased. We need more establishments that proudly proclaim that they welcome Undead patronage. 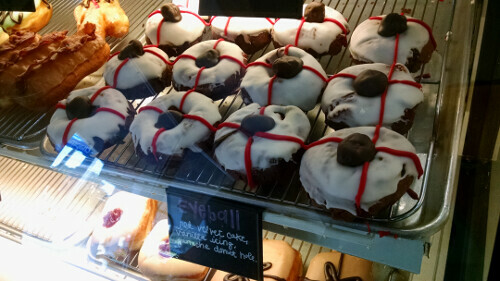 We rate the Zombee Donuts and Bakeshop as Zombie Tolerant. This entry was posted by John Sears on Saturday, July 15th, 2017 at 7:05 pm	and is filed under Zombie Media. You can follow any responses to this entry through the RSS 2.0 feed. You can leave a response, or trackback from your own site.